Thought this one deserved it's own thread. It is now on public notification on the DAC website. While I am usually for development particularly in the southern CBD, this architecture ruins the aesthetic appeal of the Devaar mansion from the front. Kind of wish they could have found something a bit more fitting. say what you will, but it is 100% better than the current monstrosity which is choking the mansion. This will only work if they do a no expense spared renovation to the mansion. I honestly can't decide what my position is on this one. Is that southern façade all glass? If so, I think I it's great. That might largely be because what's there now is such an abomination, but I do like the way the hotel appears to frame the mansion. That's appropriately deferential, I reckon. Saying that, the quality of the materials will make or break. Mants wrote: say what you will, but it is 100% better than the current monstrosity which is choking the mansion. I've always thought this was a really nice corner of the city -- the Japanese gardens and hopefully-soon-to-be-beautiful Victoria Park nearby, as well as some very impressive turn-of-the-century homes in the streets running to the east off Hutt. 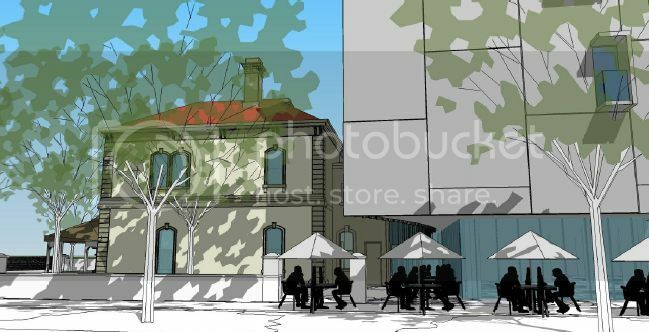 Those renders show tables and umbrellas on the footpath, so I hope the frontage is appropriate to 'engage' fully with the street. It could encourage more restaurants and cafes towards the southern end of Hutt, and make the street more of a dining 'strip'. 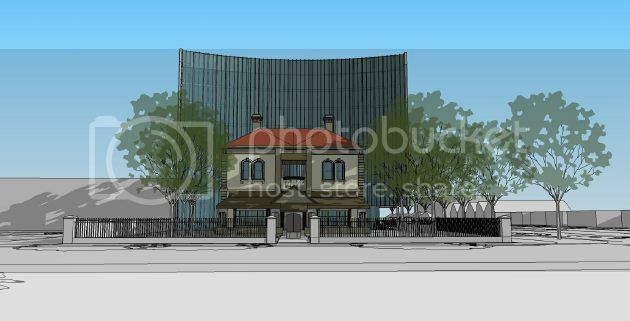 If that southern facade is indeed glass, then it will have some great views of the parklands and hills. 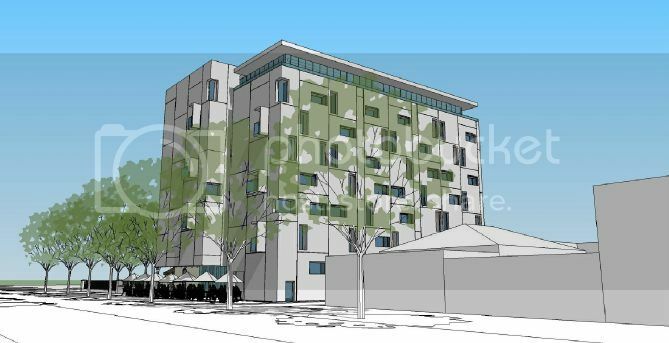 Perhaps it could be the beginning of few higher-rise buildings along South Tce, which currently doesn't really make best use of the aspect and location it enjoys. Would probably lead to greater use of the parklands, too. It's = it is; its = everything else. You're = you are; your = belongs to. Than = comparative ("bigger than"); then = next. So this is the old TPI Building on the corner right? If so, I think the proposal is great, another quality design by JPE. Maximus wrote: I've always thought this was a really nice corner of the city -- the Japanese gardens and hopefully-soon-to-be-beautiful Victoria Park nearby, as well as some very impressive turn-of-the-century homes in the streets running to the east off Hutt. 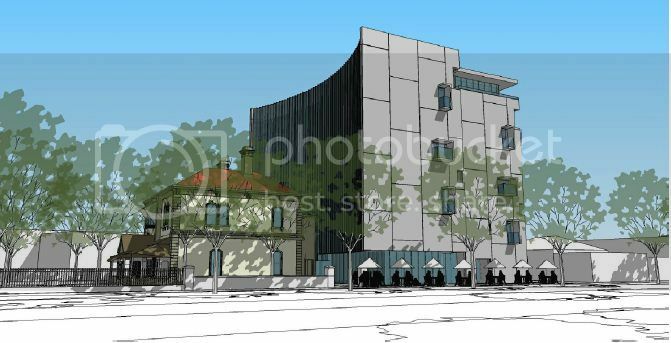 Those renders show tables and umbrellas on the footpath, so I hope the frontage is appropriate to 'engage' fully with the street. It could encourage more restaurants and cafes towards the southern end of Hutt, and make the street more of a dining 'strip'. You forgot to mention the homeless shelter across the road and dare I say the aboriginal hangout in the parklands opposite. the Japanese Gardens are fantastic, I'd love to see them increased in size two fold. 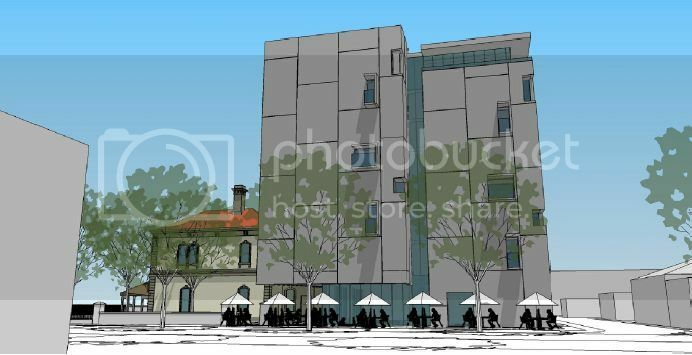 Just noticed there's some reasonably substantial discussion about this one in the CBD Development - Low/Mid-Rise thread. Perhaps would be appropriate to merge...? Yes ,this is ( was ) a really nice corner of the city . 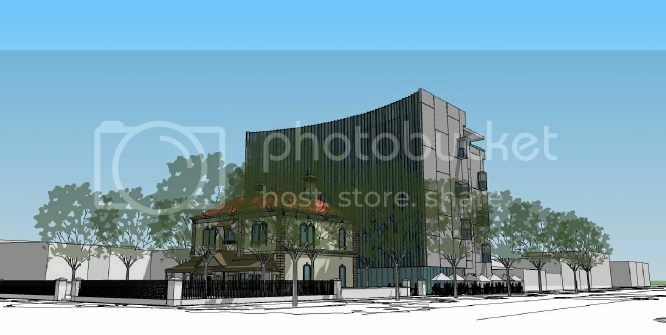 Not only will this monstrosity have great views over the parklands but also into the backyards and rear of our picturesque single storey heritage cottages in Blackburn St , Gilles St & Louisa St . It will totally ruin the charm of this area and it is the worst example of integrating new design with heritage buildings I have seen for a long time . Unfortunately, one of the realities of living in the CBD of a growing capital city is that medium and high-rise buildings are a fact of life. Another reality is that many heritage buildings are no-longer economically feasible, without additions such as this one. I think, it would be a greater shame, to keep the mansion in its current derelict state, because of some misguided fears about ruining the 'charm' of the area.